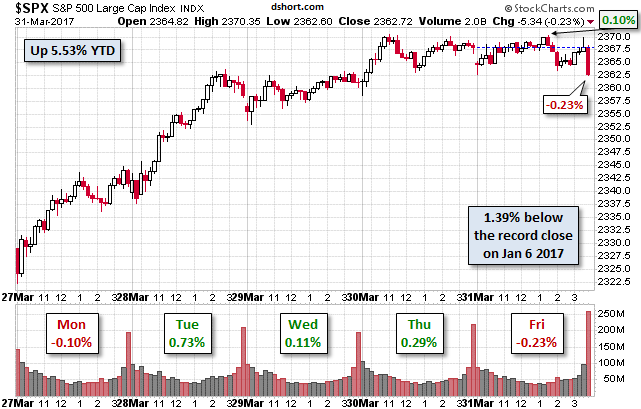 Stocks rebounded last week, with the S&P 500 rising by 0.80 percent to 2,362.72. That was not enough to completely erase the 1.44 percent loss from the prior week but it still left the benchmark index up 5.53 percent year-to-date, and just 1.39 percent below the all-time closing high. 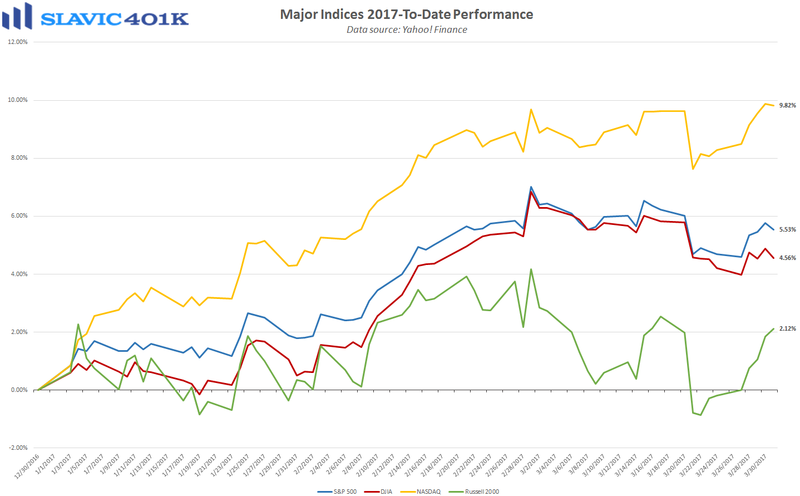 The YTD gain in this situation also represents the S&P 500’s performance during the first three months of 2017, meaning that the broad index just posted its largest quarterly advance since 2015, and its sixth quarter-over-quarter increase in a row. As for month-over-month performance, the S&P 500 ended March fractionally lower (-0.04 percent), therefore resulting in the first monthly decline for the benchmark index since October of last year. 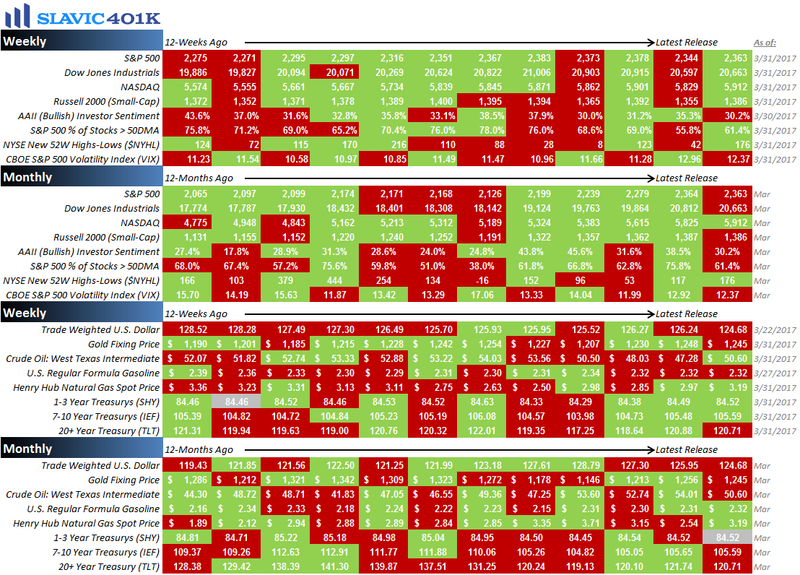 Other major equity indices have displayed a similar pattern since the election, causing many traders to now wonder if March’s disappointing performance signals that the run-up in the market is losing momentum. April, though, has historically been a very strong month for stocks, and positive economic data could help push equities to new highs. However, several potential headwinds exist for the market in Q2, including the raising of the U.S. debt ceiling, reignited Brexit talks, and the French presidential election. Traders will also continue to closely monitor Congress and the new administration’s progress on healthcare reform because the sooner policymakers can move away from this issue, the sooner they can start to tackle tax cuts, deregulation, infrastructure investment, and the other pro-growth policies that have really driven the post-election rally in the stock market. With uncertainty likely to remain elevated in the near-term, retirement investors should stay focused on the long-term goal of amassing wealth. Such efforts can be aided by consistent participation in a tax-advantaged savings vehicle, dollar-cost averaging, and regularly consulting with a professional financial advisor. As always, we are here to help with any questions you may have. To recap a few of the things we learned about the economy last week, the positives included that pending home sales jumped, consumer confidence firmed, personal incomes rose, corporate profits in America surged, and U.S. gross domestic product (GDP) growth during the fourth quarter of 2016 was revised higher. As for the negatives, mortgage and refinance applications declined, regional manufacturing activity moderated, consumer spending growth disappointed forecasts, inflation pressures continued to build, and the number of Americans making first-time claims for unemployment benefits remained near the highest level of 2017. This week the pace of economic data remains elevated, with several important reports on manufacturing, services sector activity, and employment scheduled to be released. 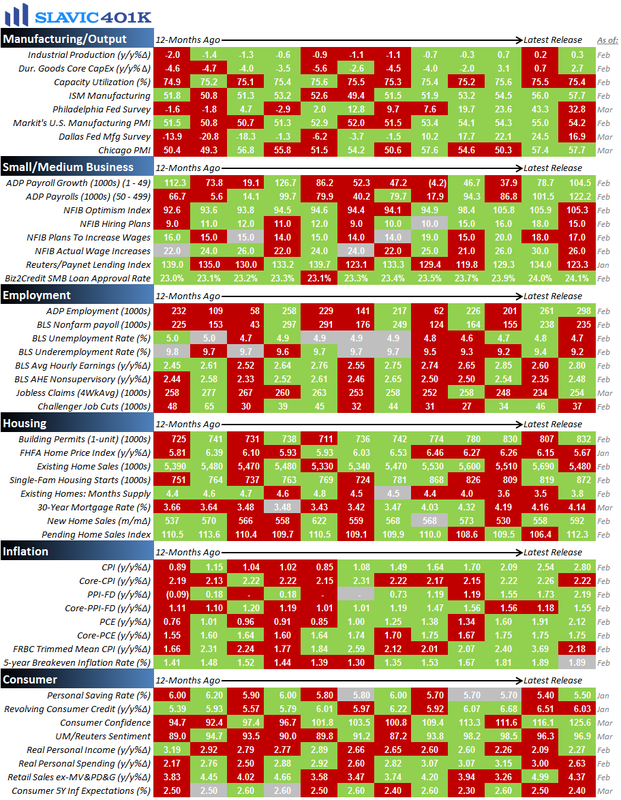 That includes the March job report from the Bureau of Labor Statistics (BLS) on Friday, as well as the potentially market-moving minutes from the latest Federal Open Market Committee (FOMC) meeting due out this Wednesday.